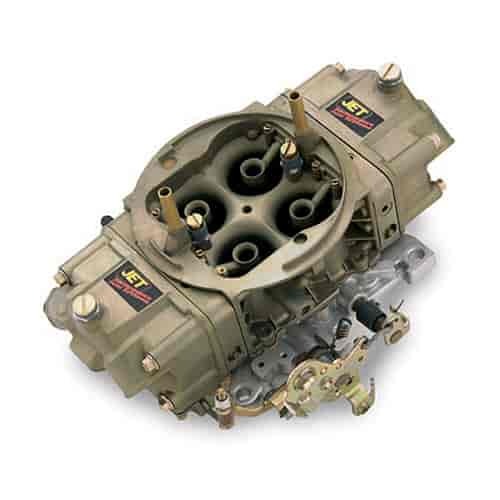 JET Offers a variety of quality modified Holley 4 BBL Carburetors. They are available in four different stages to suit your specific needs. STAGE 1 - The Stage 1 Holley 4 BBL begins with the disassembly and inspection of the carburetor for proper sizing of the idle, transition, acceleration and main metering circuits. The main body and metering blocks are then checked for straightness, boosters are aligned in the venturi and the throttle bores are aligned for proper seating. The carburetor is then reassembled using the highest quality parts and minor calibration changes may be made if deemed necessary by JET's technicians. STAGE 2 - The Stage 2 features all the modification of a State 1 plus; the fuel metering circuits are inspected, blueprinted and then calibrated to match any modifications done to the engine such as intake manifold, headers, ignition or cam change, and intended use of the vehicle, the air horn is milled to improve and equalize airflow between the primaries and secondaries. Electric choke and four corner idle circuit are optional on all Stage 2 carburetors. STAGE 3 - The Stage 3 is intended for high performance pro street style vehicles and racing application. All Stage 3 carburetors include all of the Stage 1 & 2 modifications plus radiused air inlet area and modified venturis for greatly increased airflow, modified discharge boosters for increased signal strength and atomization, machines throttle shafts, four corner idle circuits, fully modified metering blocks, modified floats and high flow needle and seats. Electric choke is optional on all Stage 3 carburetors. STAGE 4 - The Stage 4 is intended for full race, high RPM applications where the ultimate in performance carburetion is desired. Stage 4 Carbs feature all previous modification plus: the air horn apparatus is completely removed through a CNC machining procedure. The center section is then completely hand radiused to achieve the maximum allowable airflow. Removable air bleeds are installed for the ultimate in tuning capabilities. 4779S2 - JET Modified Holley 4 BBL Manual Secondary Carburetors is rated 5.0 out of 5 by 1.